R+ Scratch allows ROBOTIS Controllers to connect to Scratch and program robots in the Scratch environment. This is the main screen that appears when R+ Scratch is first started. It contains configuration menus. Change the language of the program. Check the version information and update history of the program. Check for the latest version update of R+ Scratch. Displays the list of Controllers that are compatible with R+ Scratch. Shows all the available ports that a user can connect. Either press “Auto Search” or check the Device Manager to determine which port your robot is using. Clicking the “Connect” button will connect R+ Scratch with the Controller and allow you to use the “Extension Block” in Scratch2Offline. If Scratch2Offline and R+ Scratch are properly communicating, the O icon above the “Extension Block” will change from red to green in Scratch2Offline. If Scratch2Offline is installed, clicking on the “New Scratch” button will load a new Scratch project that includes the blocks relevant for programming the selected Controller in Scratch2Offline. You will first need to save the Scratch project before it loads in Scratch2Offline. If Scratch2Offline is not installed, clicking on the “New Scratch” button will link to the Scratch2Offline download page. See Installing Scratch2Offline in the Miscellaneous (link) section. 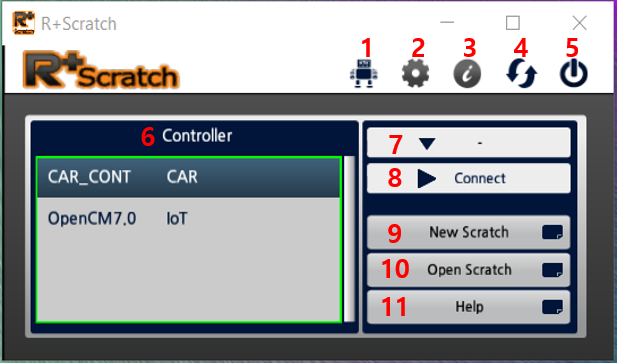 If Scratch2Offline is installed, clicking on the “Open Scratch” button will load the list of provided example projects for the selected Controller. Double click on example project from the list to load that project. Clicking the “Help” button will load a folder containing help files. Files named after the relevant Controller contain descriptions of the blocks used to program that Controller. Files with a *.json extension can be used when directly adding “Extension Blocks” in Scratch2Offline. See Directly Adding an Extension Block in the Miscellaneous (link) section. This method utilizes a micro B USB cable or an LN-101 (USB Downloader). 1. Connect the Controller to your PC using a micro B USB cable. 2. Power on the Controller. 3. Click on the “Port Selection” button to see the list of connected devices. 5. Click “Connect” to begin communicating between robot and PC. 1. Connect the Controller to your PC using an LN-101 (USB Downloader). 1. Connect the BT-210 module to the Controller. 4. Click on the “Port Selection” button to see the list of connected devices. 6. Click “Connect” to begin communicating between robot and PC. 1. Connect the ZIG-110A to the Controller. 2. Connect the ZIG-100 + ZIG2Serial + USB2Dynamixel setup to your PC.